Make the precious people in your life feel happy, loved, cared and remembered throughout the life. Celebrate the significant days in your life in a unique way, and make a day memorable for a person you love. Here is a gift of nature, designed by the floral experts at Kapruka, for you to express yourself in a heartfelt manner. 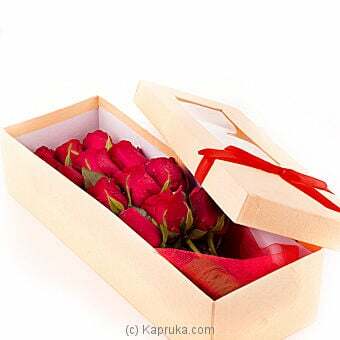 An elegant, stunning and fresh flower arrangement consist red roses and babies breath placed in a recycle paper box is a perfect gift for a perfect person on a perfect moment.